Increasing levels of college student loan debt don’t appear to be having a significant effect on enrollments. But higher debt is affecting the economy as a whole and it is having a disproportionate impact on low-income borrowers and students who attended for-profit colleges. Thank you to Mary Piccioli for her assistance with this piece. An abbreviated version of this post originally appeared in University Business. A story in Forbes reported on a new poll by LendUSA/WhatsGoodly where millennials said that student loan debt was a bigger threat than North Korea. Financial analyst Suze Orman wrote several years ago that student loans were the single most dangerous threat to our economy. Just how much of a threat is increasing student debt—to higher education, to the housing market, to recent college graduates’ prosperity? There’s no question that recent graduates are leaving college with more student loan debt. More students are taking out loans and they’re borrowing larger amounts. Total college student loan debt was $1.3 trillion at the end of 2016—an increase of about 170 percent from 10 years earlier, according to the Federal Reserve Bank of New York. The average debt is now about $30,000. It has been argued that college student loan debt is influencing job choices, home ownership and even the marriage rate. But apocryphal stories about students owing $100,000 or more coming out of college don’t represent the reality for most borrowers. In 2015, roughly two-thirds of student loan balances were $25,000 or less (see below). 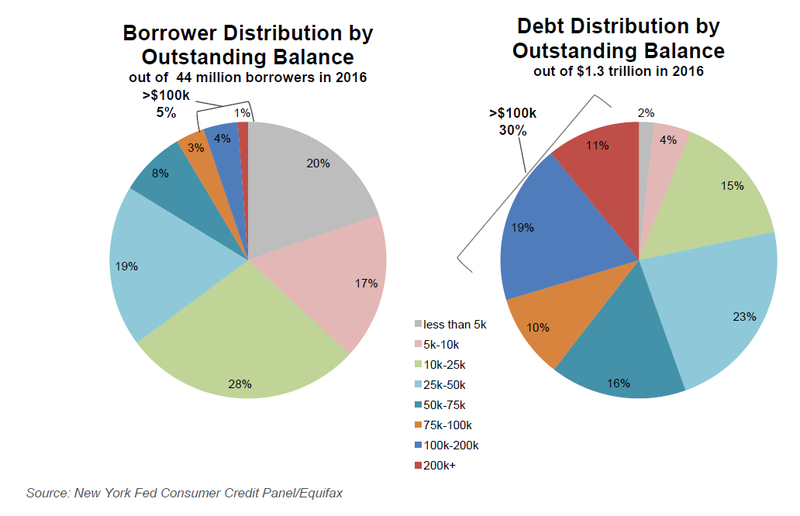 Fewer than 5 percent owed more than $100,000 However, this 5 percent of borrowers accounted for 30 percent of total debt, as shown in the following chart. Borrowers who owe more than $100,000 account for 30 percent of total student loan debt. Click to enlarge. There is no question that, compared to other debt—mortgage, credit card, auto—student loan debt has increased at a higher rate in the last several years. Relative to 2008, college student loan balances have roughly doubled, compared to declines in mortgage balances and credit card debt and increases of about 50 percent for auto loans. More significant is the fact that, during this time, student loan debt has increased at a faster rate for lower income borrowers (see the “student loan” trends in the chart below). Student borrowing also varies significantly as a function of institutional control. Notably, Fortune reported that, “Students at for-profit colleges accounted for 35 percent of defaults during the three year period starting in 2013—down from 44 percent two years earlier.” This is despite the fact that students at for-profit colleges account for just 26 percent of all borrowers. These students are the most susceptible to unemployment and underemployment, raising their risk of default. Borrowers from areas with average incomes of less than $40,000 had 5-year default rates of 35 percent, compared to 13 percent for those with incomes of more than $80,000. 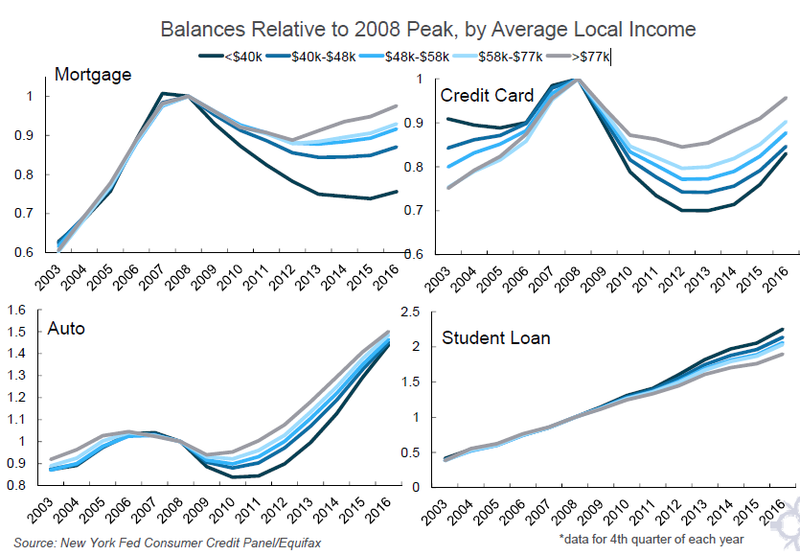 In addition, repayment and default rates differ significantly by loan balance amount. The NY Fed reports that 5-year default rates on balances of up to $5,000 were just over 31 percent. This compares to 17 percent for balances of over $100,000. In a study of student debt and earnings, the Brookings Institution focused on small borrowers. “The small borrowers tend to be those who spent just a year or two at a for-profit or community college. They spent little time in college, and so racked up little debt. But they also built up little human capital (and had low stocks to begin with), and so do relatively poorly in the labor market. The New York Fed’s April 2017 study of student debt noted that the steep growth in college costs has contributed significantly to increased college student loan debt. In the public sector, these increased costs have been driven largely by reduced state spending on higher education. Though several states have recently made significant investments in reducing college costs by introducing free tuition for either 2- or 4-year degrees in the state system, these have not yet slowed the rate of increase in nationwide student borrowing. A July study by the NY Fed noted that “…reductions in state spending on higher education have resulted not in a decline in schooling but instead on increased student loan debt…As college costs increase, American students do not forego education, but instead amass more debt.” Other findings from the July study include the observation that student borrowing by age 25 rose from 25 percent of the student population in 2004 to nearly 45 percent by 2016. As noted by several sources quoted above, the burden of increased student debt has fallen disproportionately on lower-income students. Many American colleges and universities are seeing increases in the number of new students with high levels of demonstrated financial need. Robert Kelchen noted in a 2015 article on high-need students that one in three U.S. undergraduates showed a zero expected family contribution (EFC) toward their educational expenses, based on the Free Application for Federal Student Aid (FAFSA). Loan repayment assistance as an employee benefit. Some employers are beginning to offer repayment assistance for student loans as a part of their benefits packages. Forbes, Time and other media outlets have recently reported that companies like Fidelity, Penguin Random House, and Staples are now offering to pay $2,000 or more per year to help employees pay down their student loan debt. State assistance for mortgage/student loan payment. Last year, Maryland created a program that helps pay down student debt for some first-time home buyers. Rhode Island’s Grad Grant Program provides down payment assistance for first-time home buyers who complete a degree within the last three years. And a similar program has been proposed in the Ohio legislature. Income-based repayment. Student loans with repayment terms that are contingent on income have been around for several years. The Income-Based Repayment (IBR) plan currently available from the federal government requires borrowers to pay 10 percent of their discretionary income each month, with remaining debt forgiven after 20 years. A similar plan has been included in the White House’s budget proposal for fiscal 2018. College/university efforts to improve affordability. Ohio State recently announced an initiative to cover the full cost of tuition and fees for Ohio residents who qualify for a Pell Grant by filling whatever gap remains after federal, state and other aid is awarded to the student. While it’s encouraging that institutions, employers and government agencies are beginning to take action to address increased college student loan debt, greater attention should be paid to the disproportionate impact the trend has had on low-income borrowers and students who attended for-profit colleges. How can you develop a more strategic financial aid policy? Talk to us. Awarding, student debt, affordability, and access are all complex issues that we have helped many colleges and universities address. I recommend contacting RNL for a consultation on strategic financial aid awarding and enrollment management. My colleagues have extensive experience and can discuss your current situation so you can balance enrollment, cost, and revenue needs. Click here to request a consultation.